The ousted Yemeni president, Ali Abdullah Saleh, has taken a step back from forming a government that he had agreed upon with Houthi militias, media sources reported. Saleh had many conditions before forming the government, according to the sources, which included wanting all the governmental institutions to be freed in order for the government to manage its institutions without the interference of the Supreme Revolutionary Committee that he also asked to be dismantled. The Supreme Revolutionary Committee - also referred to as the Revolutionary Council - is an interim body in Yemen formed by the Houthis. He reportedly wanted the Houthis to provide the needed clarification regarding the two billion dollars that were withdrawn a few months ago from the Central Bank. 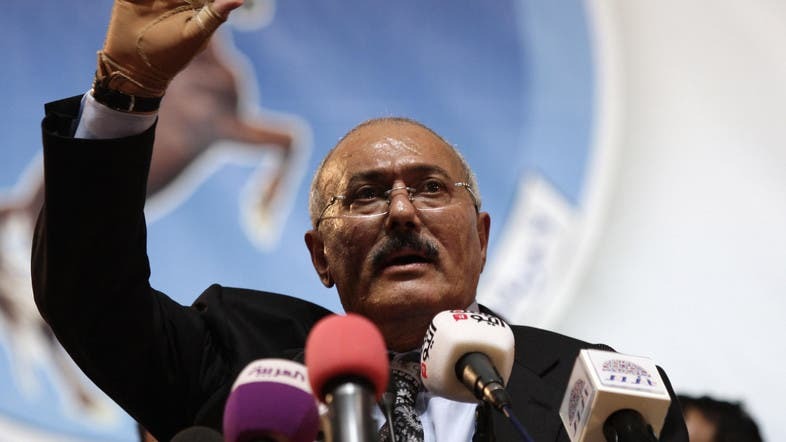 Meanwhile, earlier this week, Saleh considered the recent American initiative and UN peace plan in Yemen were a good start for the negotiation process. The ousted president has also asked to stop all military operations undertaken by the Arab coalition. His conditions also included the withdrawal of foreign forces from Yemen and the abolition of all sanctions. Saleh said that once his conditions are met, he would be ready to deal positively with any initiative to preserve the integrity, security and stability of Yemen and the region. *This article is also avalible in Arabic in AlArabiya.Net.